Maria is married to Marino, and her brother, Marino, lives with them. They are in their 80’s and older, and have been together on their farm for more than 60 years. They are the last of a dying generation of people who live on and work the land. They are entirely self sufficient. They are wise and warm, and wily, and funny too, and have generous hearts that have remained open in spite of the hardships they’ve endured by living in a manner that belongs to the early part of the 20th century, or maybe even earlier. The things they know about the land, the animals, the seasons, the very meaning of the winds, could fill a book. And Marino (with the stick) was a prisoner of war in WW2, and managed to walk all the way back home from up near the Russian border. 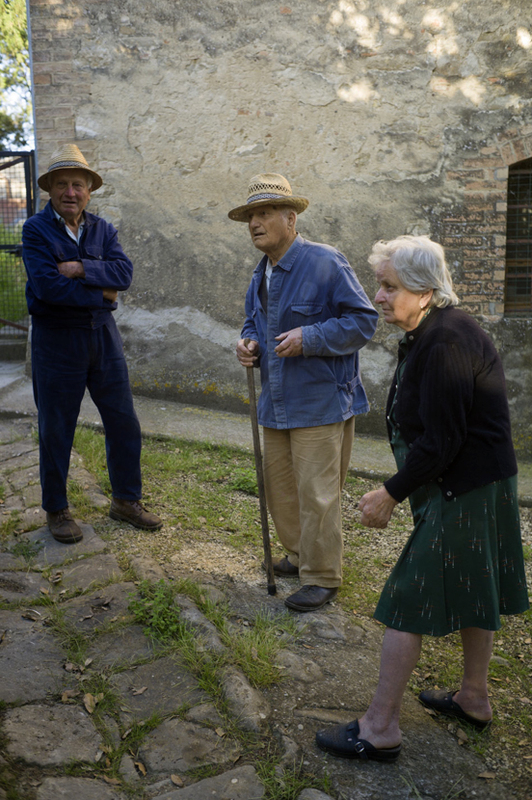 Each time we visit with them we come away with a feeling that we traveled back in time to a part of Tuscan life that every day is slipping further away. To make a portrait of these people – as you might imagine they are not aware of the ways in which we moderns make photographs all the time – so to make a portrait that holds their innocence as a value, requires a delicate method of being very present and yet as direct as they are, but also by maintaining a space that doesn’t take anything away from them, nor make them skittish. So genuine Interest in their lives and stories provides a basis for being in and observant of their rhythm. It supports the making of informal portraits. There is a touch of anthropology in working like this, not that I know anything about that science, but over all these years I’ve learned how to be with people, and to become slightly invisible while being very present. This is part of the ‘way of being’ that photographers develop in order to slip into the lives of others. This entry was posted in Contadini, Portrait, Tuscany and tagged portrait, stones, Tuscany, Wall on May 19, 2015 by joelmeyerowitz2014.